Planting season is at hand. I had big plans for soil prep and planting things like radishes and potatoes this weekend, but I had forgotten about May Day and a few other things, so we’ll see. Fortunately, I am taking a working vacation later this week (don’t ask) so I will have two kid-free days to prep and plant away! Meanwhile, there’s a lot happening out in the yard. 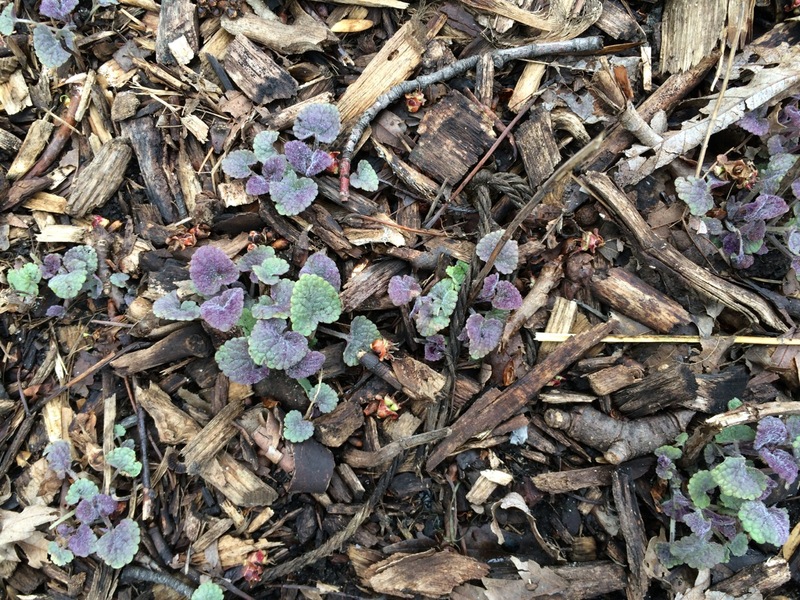 Anise hyssop is living up to its reputation and is now filling in a few niches around the back yard. Quite a few niches. I can’t say I mind, though. It has beautiful purple flowers, is great for bees, and makes one of my favorite herbal teas. Did I mention it’s shade tolerant and native? I’ve also been taking stock of our rabbit damage situation. Did I mention that rabbits don’t eat anise hyssop? Really, I can’t say too many good things about that plant. 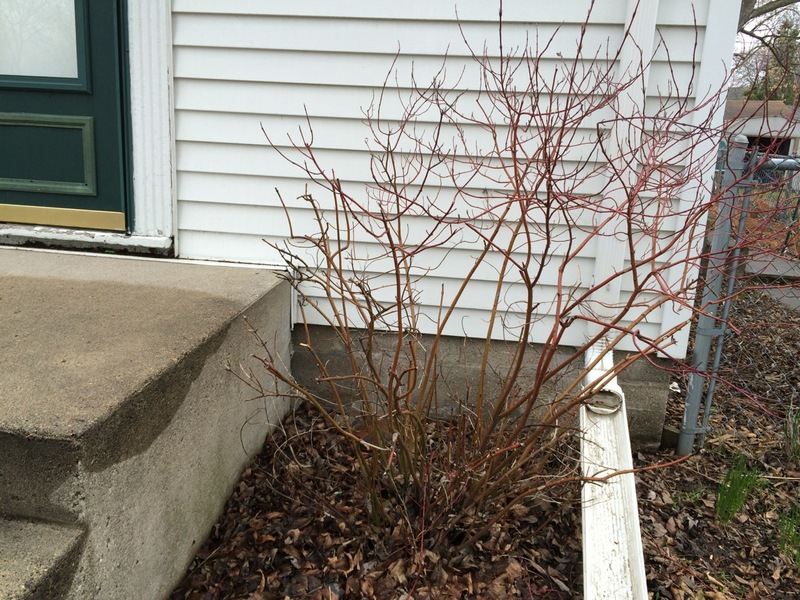 Here is the red twig dogwood next to our front steps. Apparently, they brazenly perched themselves on the step in order to nibble away at it. Fortunately for us and the rabbits, this plant is misplaced: it’s too big for this spot and we have to trim it every year anyway. How do you tell if you have rabbit damage? 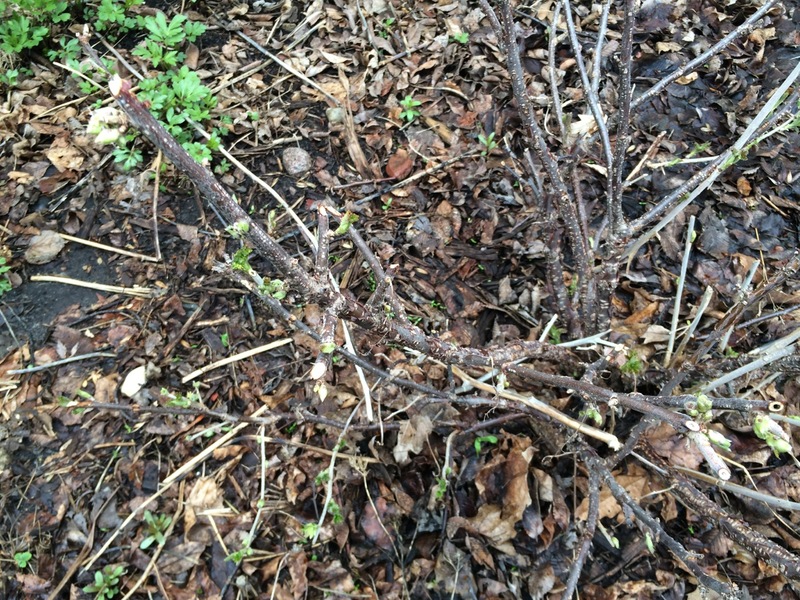 Look at the ends of the twigs of my Red Lake Currant bush. They look like they’ve been snipped off with pruning sheers. I did not prune this bush over the winter. It’s definitely rabbits. They chewed this down a little further than usual this winter. This fall I’m going to try and work harder at protecting some of my fruit bushes from them. Several things going on here. 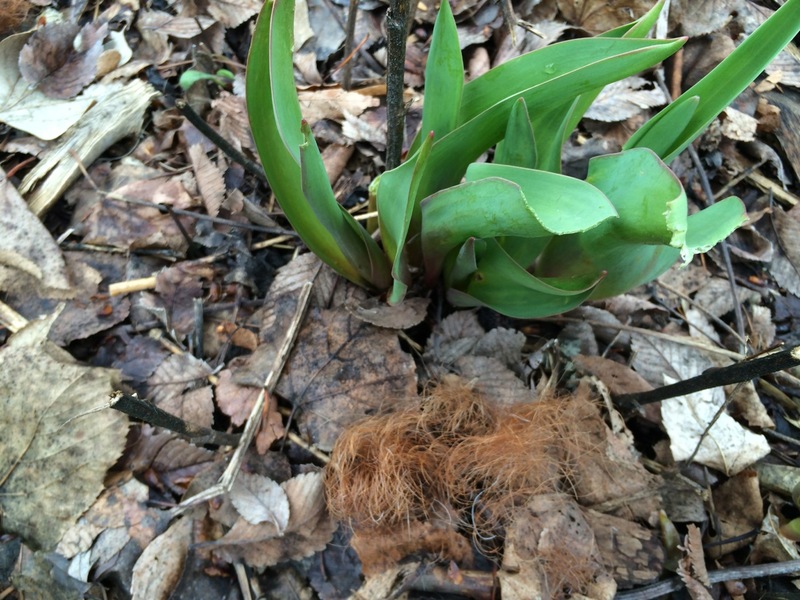 First: I planted tulips before native plant mania took hold in my brain. They are not native, nor do they provide any value to wildlife, except squirrels who eat the bulbs in the fall and rabbits who eat the foliage when it first pops up in the spring. No value whatsoever to bees, butterflies, or birds. But, being Dutch, well, you know. 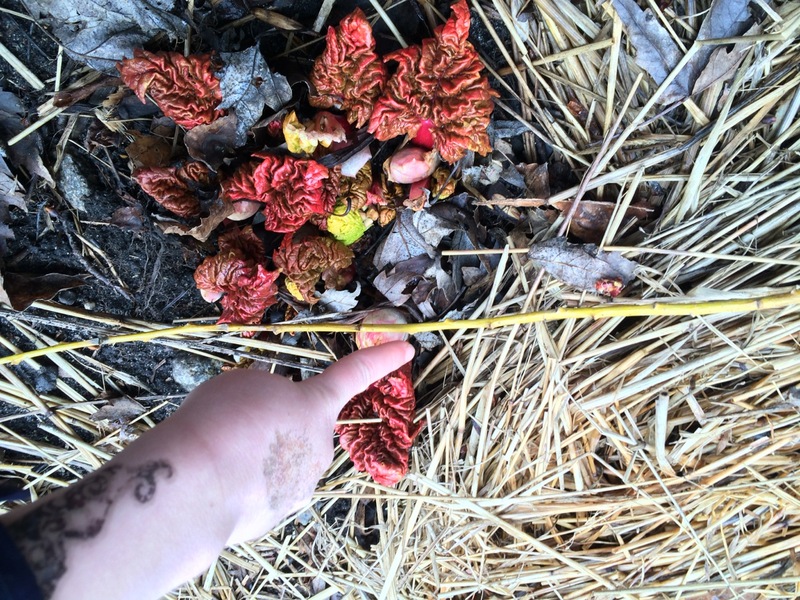 Anyway: see that reddish stuff that looks like… oh dear is that hair? Yes, it is. Adam saves his beard trimmings all winter long, and it works great for rabbit deterrant. I spread it around the new tulips and strawberry plants every couple days or so until they get big enough to no longer be appealing to rabbits (right around bud stage). You have to re-apply because the smell wears off. Also, it biodegrades quickly, which is a good thing, because… gross. 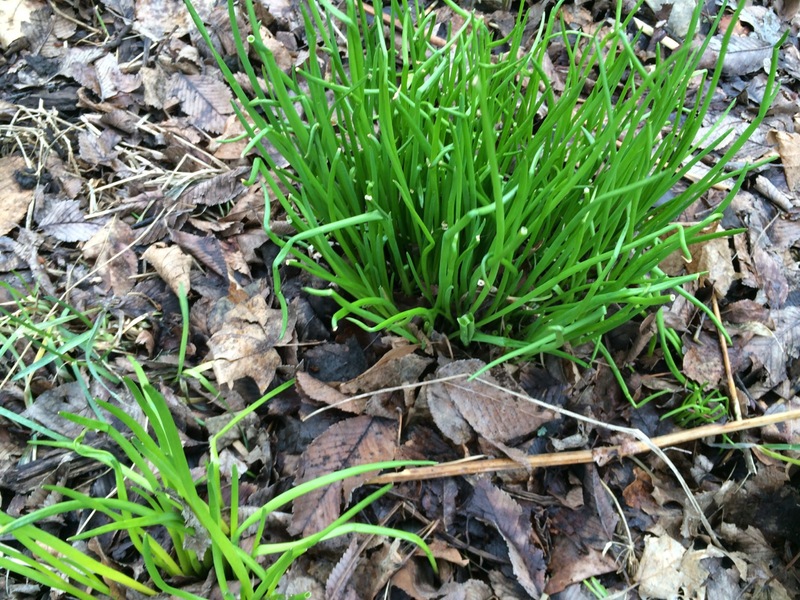 Chives are back, and fantastic-tasting right now. I’ve been putting them on EVERYTHING. Also rabbits don’t eat them. 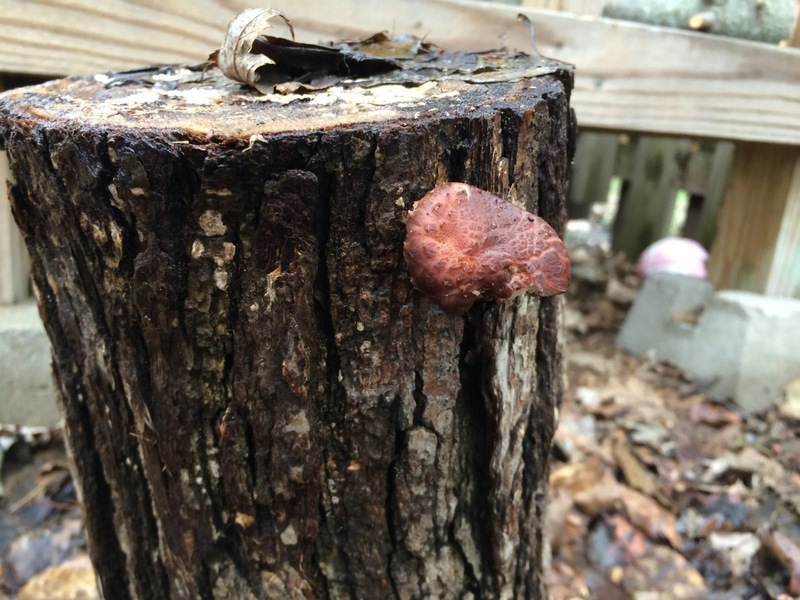 Our shitake mushroom log (purchased from these folks) also appears to be fruiting. This cold rainy week was good for something! 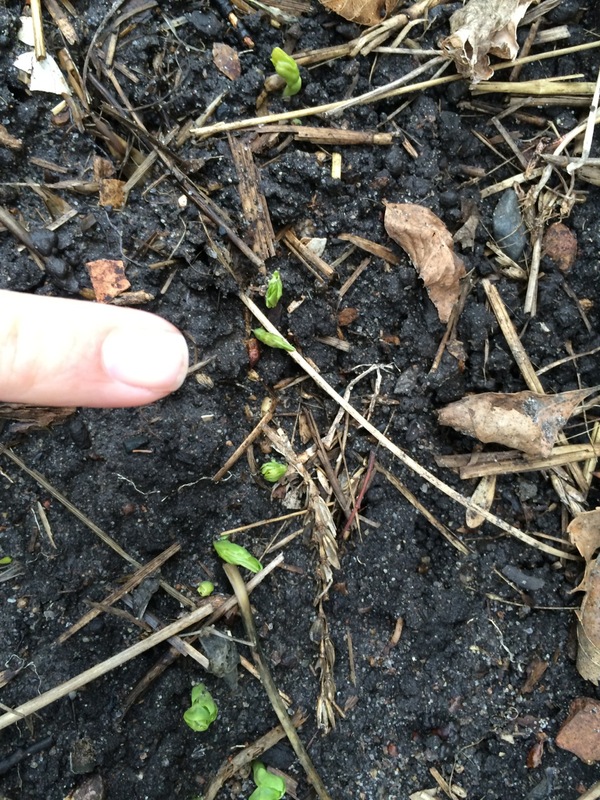 My snow peas, planted Easter weekend, are also poking through. I’m so excited for snow peas. Rhubarb is really funny-looking when it first comes up! Rowan, inspired by my last photo, demonstrated scale for this one. With temporary tattoos. 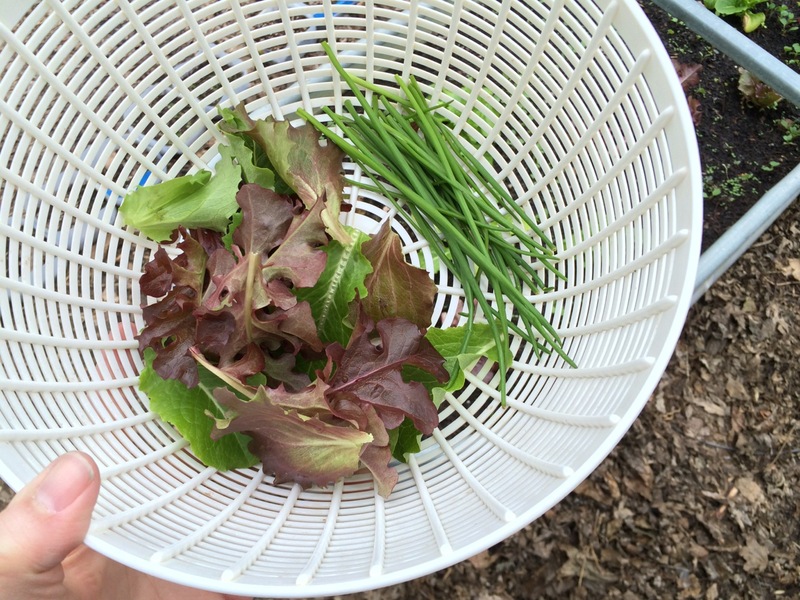 Here we have our very first back yard salad of 2014, harvested April 26. A small one, to be sure, but you have to start somewhere. Welcome to planting and back yard foraging season! Nice post again, Jennifer. Thanks. So inspiring to see new garden life. This week should bring great growing conditions for MN. Glad I didn’t plant any cool weather veggies. Will be in the upper 90s for three days. Awful.